Hamilton wasn't consistent with how it named calendar models in the 1970's. Sometimes models are Auto Cal models and sometimes they carried over the Dateline A-series that began in the 1960's. One of the Dateline models was the 1972 Dateline A-593. It was produced for three years. 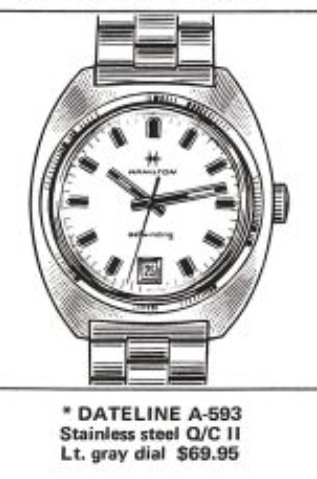 You can't tell from the black and white catalog image what the Dateline A-593 ought to look like. The case is stainless steel and the dial is light gray - that's about all you know. The watch also uses a Quick Change II movement. I received my project watch from a friend of mine. I happened to see this watch on eBay a while ago and I suspect my buddy had the bracelet for it. He's one of those crazy people who hoards bracelets in the hopes he someday finds the watch to go with it. As a result, he has a world-class collection of Hamiltons with their original bracelets. Looking at the project watch, I can see it has an issue with the stem. I thought initially it was just too long. However, it doesn't wind the watch. I can pull it out to set the date and time though - just not wind the watch. This bracelet has a deployment style clasp that is still installed on new Hamiltons today. The case has a screw-on case back - that tells me this is a one-piece stem - which is good. Two-piece stems can be finicky to trim. The 822 movement is based on an ETA 2783 movement - and you'll see why in a second. Notice the screw that holding the rotor on. It has something under it. To get the movement out I need to remove the stem first. I have to push the set lever indent in and pull the stem out at the same time. The ETA 2783 uses a helicoid stem with a funny twist. The ETA 2782 uses a straight stem. So this watch has the wrong stem installed. It will fit but it won't move the clutch wheel up against the winding pinion. The twist of the helicoid stem is what works that magic and allows the watch to wind manually. I noticed an odd washer-like thing on top of the 4th wheel pivot. I also noticed the screw on the ratchet wheel isn't correct. In fact, the screw that held the rotor on is for the ratchet wheel and the ratchet wheel is for the rotor. Whoever reassembled this watch last time went through a lot of trouble to put the screws in the wrong spots - and had to add a washer to make it work. The dial-side of the main plate looks to be in good shape. Everything is taken fully apart and cleaned. Time for reassembly. The watch didn't want to run cleanly. Ultimately, I realized the hairspring is bent. The watch will tick but it won't keep time well. I had to take the hairspring off in order to try to get it back in shape. It's not perfect but hopefully it will work better now. Hairsprings are REALLY hard to tweak - it takes a lot of patience and excellent No 5. Dumont tweezers. Ultimately I had to resort to plan B - and use a replacement balance. My tweaked hairspring was better but still not good enough. I think I got it shaped well in the round but it wasn't exactly flat. This type of balance is used in a lot of ETA grades from the 1970's and I happened to have a nice donor. Looks like it's going to need a little tweaking ... the amplitude is great but the beat error and beat rate need to be adjusted. Fortunately, this balance is very easy to adjust both metrics. How's that for dialing the specs? I'll leave it running a little fast for now and adjust it again after it settles in. Everything looks great now that it's reinstalled in the case. The orange hands definitely make a statement on the otherwise mono-chromatic background. This watch surely fits in well with "big and chunky" theme I'll have going for the next few watches.